I tried to share this cake. I really did. But it's much more complicated to try to take an ice cream cake to work than a regular cake. So after a day of antiquing and flea marketing, ending with a hair appointment which was long overdue - I've cut my own hair since I was 20 and salons scare me a little - I texted a few friends to see if they wanted to stop by for a piece or two on Saturday night, but they couldn't make it, so... That leaves it all for me, I guess! It is my birthday cake, after all, and I'll eat it if I want to. 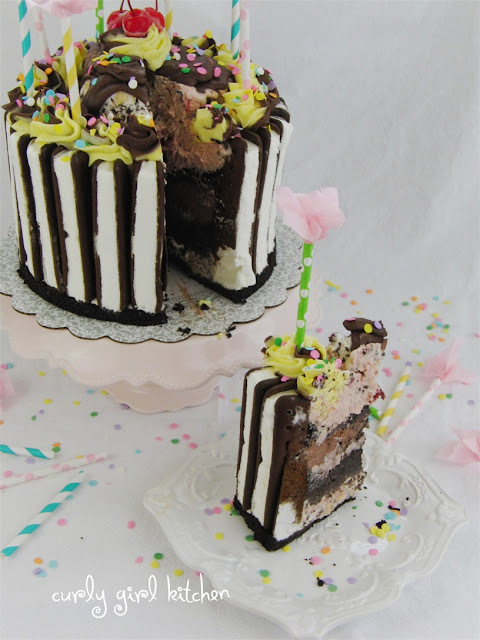 Years and years ago, I saw a photo in a magazine - I have no idea now which magazine it was, and haven't been able to find the photo I remember online either - of an ice cream cake made with ice cream sandwiches circling the cake. 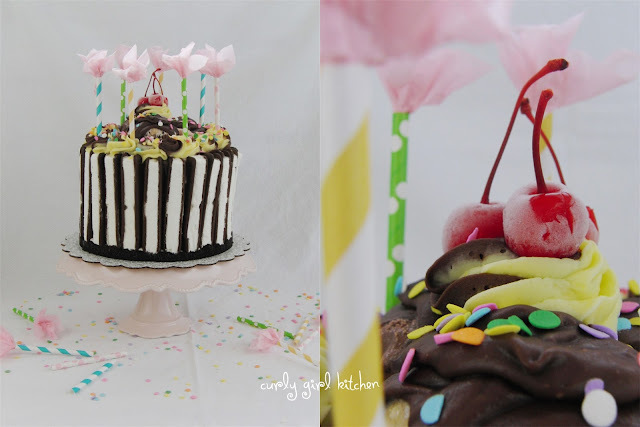 That beautiful cake, with its lovely stripes around the sides and pretty pink ice cream center emblazoned itself in the archives of my memories, just waiting for its chance to be recreated in my own kitchen. Since I'm turning 35 this week - which feels like a momentous birthday somehow - I decided it totally warranted a completely spectacular cake. I stood in the ice cream aisle, staring at the frosty glass doors trying to decide which would be the most decadent, the most luxurious. I picked up several, then changed my mind and put them back. This scenario replayed itself several times, for a good five minutes, before I finally had to force myself to just choose something. Anything. 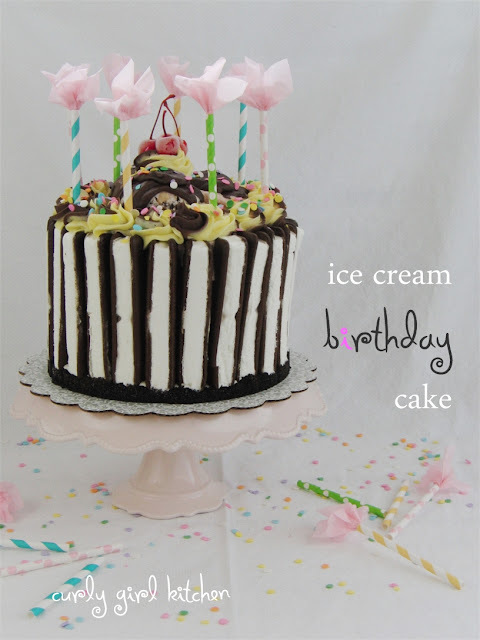 After all, it's an ice cream cake. Any flavor is going to be amazing. Also, I was getting cold standing there. The three flavors I ended up buying were chocolate chip cookie dough for the bottom layer, dark chocolate moose tracks for the middle, and red velvet cake for the top. I guessed that I would need about a quart of each, but since most ice creams only come in pints or half gallons, I had to buy the half gallons. We have a lot of leftover ice cream in our freezer right now. I had baked a chocolate cake the night before, which was cooled and ready to be crumbled for the cake layers. 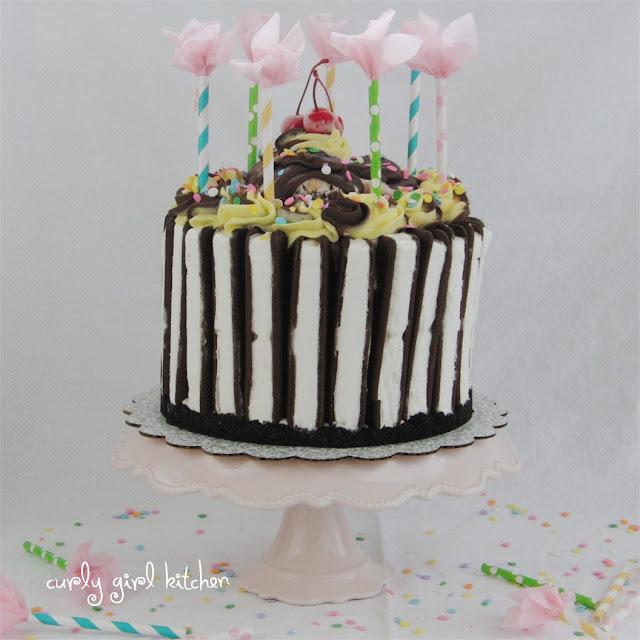 And, although I had originally wanted more pink on the cake, maybe with swirls of pink buttercream around the top, I just used some leftover buttercream that I had in the freezer - a lemon yellow buttercream and a dark chocolate buttercream. 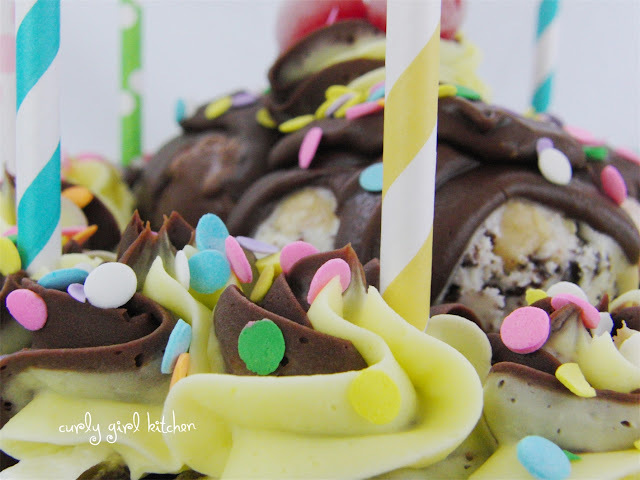 Making an ice cream cake is a little bit of a process - easy but requiring patience - because you have to build it in layers, then freeze it in between each step of the process. And the final freeze needs to happen overnight, because it takes a while for all that soft ice cream to firm up again. So with everything I needed, I set to work making this on Friday night, with a plan to photograph it on Saturday, and then wait till my actual birthday to eat it and then eat a piece right away. Because who are we kidding. 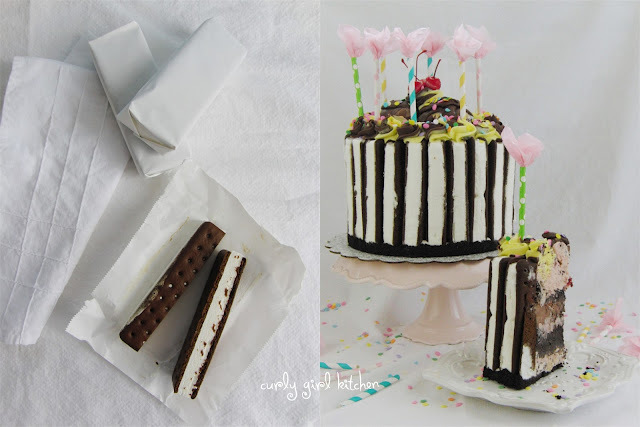 For my cake design, of course there are ice cream sandwiches, cut in half lengthwise and placed all around the sides, on a bed of chocolate cake. Then the cookie dough ice cream. More chocolate cake. Chocolate moose tracks ice cream. Still more chocolate cake. Red velvet cake ice cream. A scoop of each ice cream flavor on top, drizzled in ganache. Swirls of buttercream and a few maraschino cherries. And sprinkles. Lots and lots of confetti sprinkles! 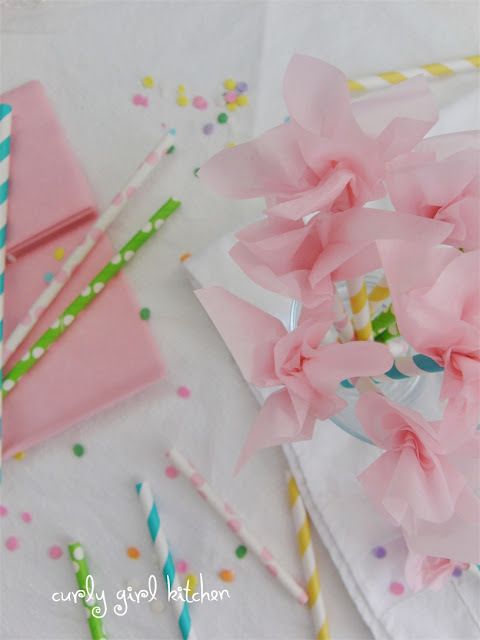 The paper straw "candles" were inspired by Icing Designs. You may not need to use all of the cake and ice cream; just use as much as is needed to build the cake. 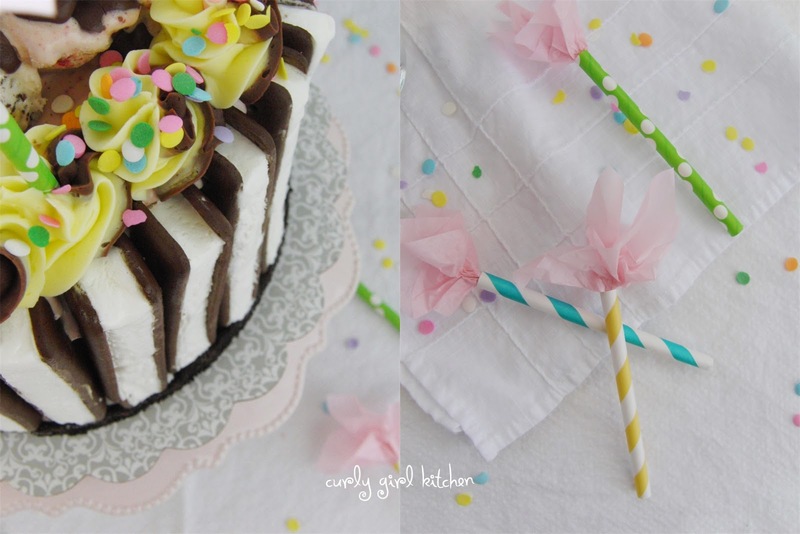 Bake and cool the cake completely; use your favorite homemade recipe or buy a cake (no frosting). In your food processor, work in batches to pulse the cake into crumbs. Place crumbs in a covered bowl and set aside. Line the sides of your pan with parchment paper. Tape doesn't stick very well to parchment paper, so I just used a few paper clips to hold the seams together. The paper should be higher than the sides of the pan, so that it comes up as high as the ice cream sandwiches. Scoop 3 cups of the cake crumbs into the bottom of the pan and press down firmly into an even layer. 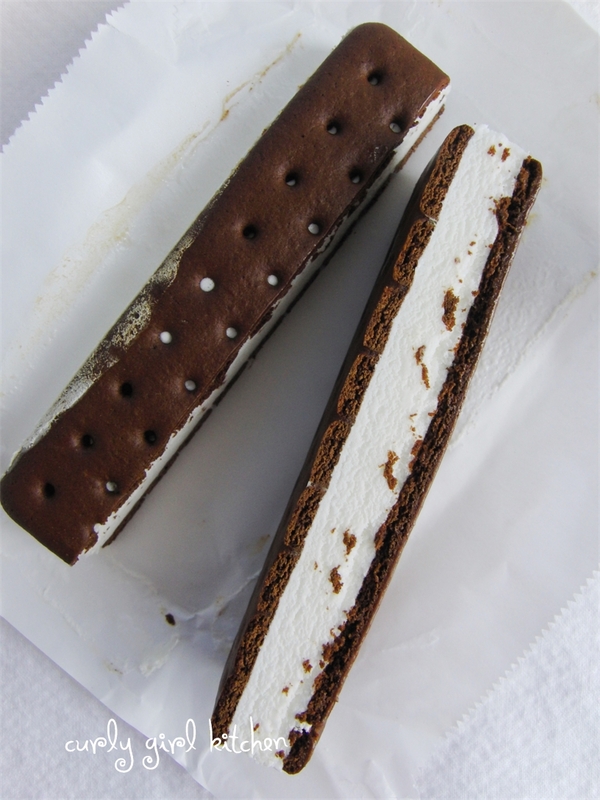 Next, working quickly so that the ice cream sandwiches don't soften, unwrap them and cut each in half lengthwise. Place the ice cream sandwiches around the sides of the pan; if you like, you could pipe a little frosting between each to "glue" them together, but I didn't have any trouble with them falling over as I was positioning them. Set pan in the freezer. Take one quart of ice cream and let it soften at room temperature for 20 minutes. 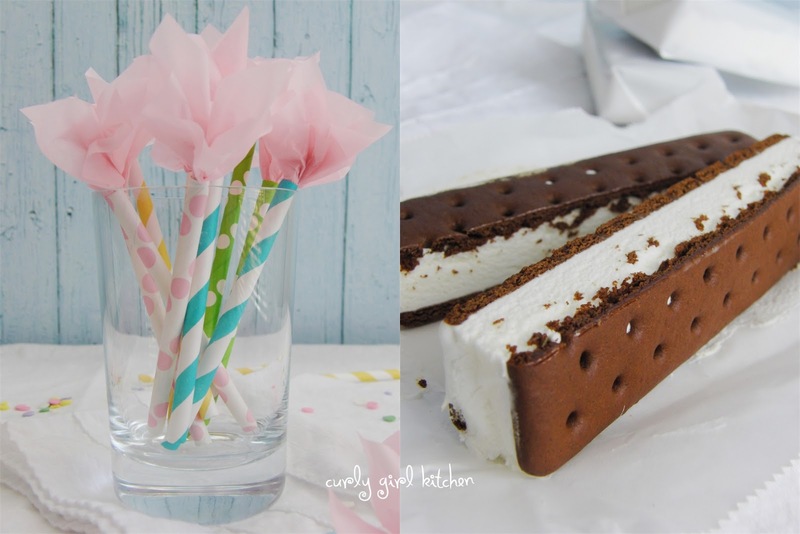 Stir the ice cream so you have a smooth consistency and spread about a 1-inch layer over the cake base. Make sure to reserve some of the ice cream for the 3 scoops on top of the cake. Return pan to the freezer and freeze for 1 hour. Scoop 3 cups of the cake crumbs over the first ice cream layer and press down gently. Repeat Step 4 for the next flavor of ice cream. Freeze for 1 hour. Repeat Step 5 for the final layer, and smooth out the top of the cake. Freeze for 1 hour. Scoop 1 scoop of each flavor of ice cream and set the 3 scoops on top of the cake. Freeze while you prepare the ganache. In a small saucepan, warm the cream gently over medium low heat, just until it simmers. Remove cream from the heat, add the chopped chocolate, and let stand for 3 minutes. With a spatula, stir the ganache until smooth and creamy. Let cool for 10 minutes, then drizzle the ganache over the 3 scoops of ice cream on top of the cake. 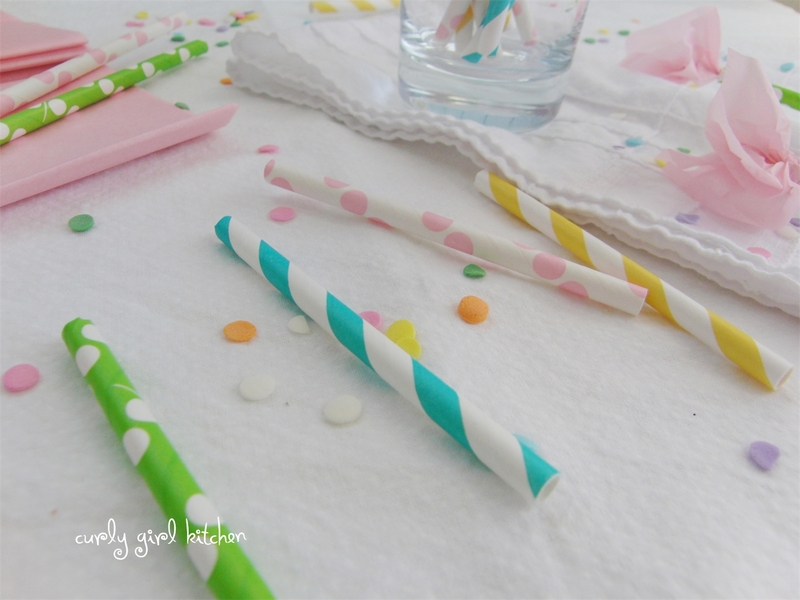 Sprinkle with some of the confetti sprinkles. Freeze cake overnight. After the cake has been frozen overnight (and do not rush this step, as you built the cake with very soft ice cream, and it needs plenty of time to firm up all the way through), remove the sides of the spring form pan. 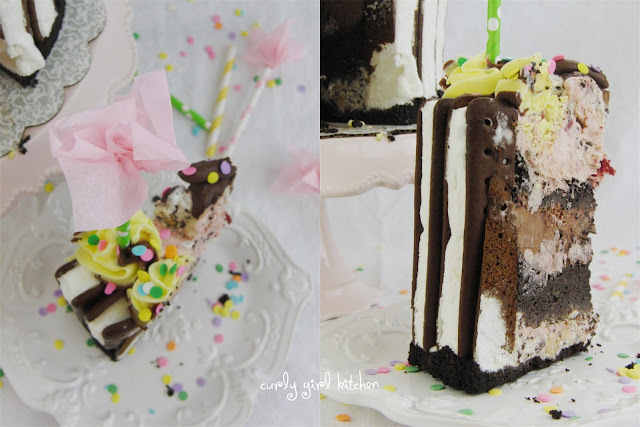 Slide a sharp knife between the base of the pan and the bottom of the cake to loosen it, then use a cake lifter or a large spatula to transfer the cake from the base of the pan to a cake board or plate. Peel off the parchment paper. 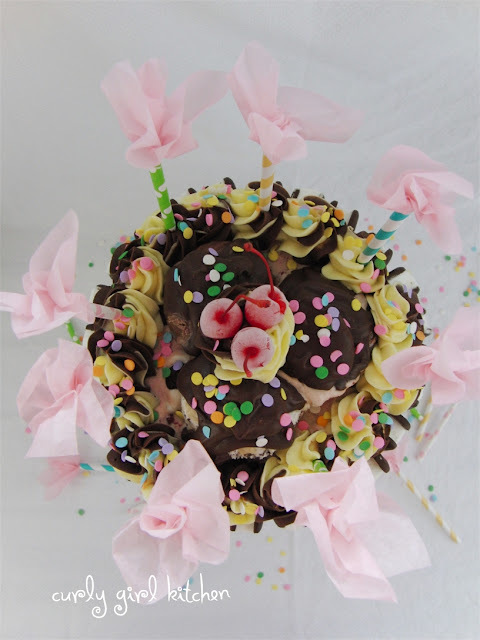 Lastly, pipe the buttercream or whipped cream in swirls around the top of the cake, and one swirl right in the center. 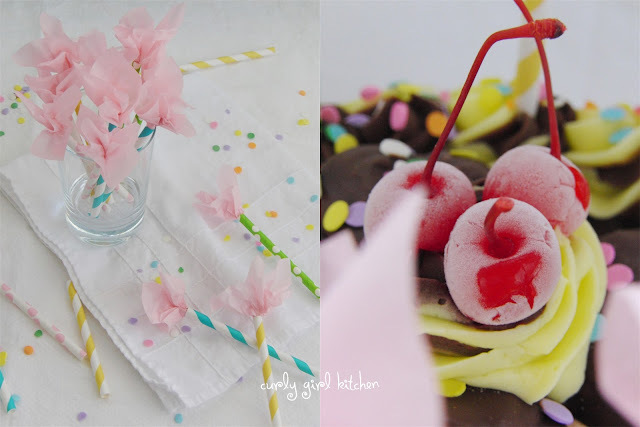 Garnish with the cherries, more sprinkles, and the paper straws. Freeze until ready to serve.